Across the board, colleges and universities from coast to coast are trying to grow their international enrollments. Unfortunately, many institutions are more focused on the challenges involved than the solutions available. Now, it’s important to understand just how lucrative international students are for a higher education institution. These learners pay out-of-state tuition rates and have more need for opt-in student services and offerings than their domestic colleagues. In the past, institutions have found ways to grow international enrollments when their choices were limited; enrollments of international students grew 42 percent during the recent recession when postsecondary funding hit the floor. Unfortunately, many institutions look at the state of international enrollments in the US and simply lose hope. A very small number of institutions (5 percent) enroll the vast majority (69 percent) of students in the US. Many college and university leaders simply don’t see how they can break into the space or increase their footprint. But the answer is actually quite clear: Intensive English Language Programs (IELPs). This video explores how IELPs can allow institutions to matriculate otherwise academically-prepared students into full-time degree programs after helping them get the necessary language skills. 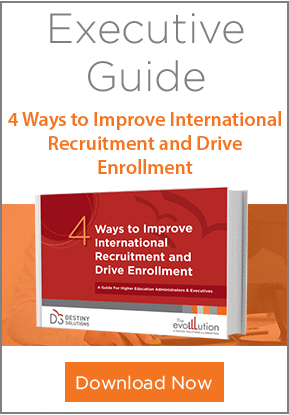 Internationalization Key to Success in the International Marketplace: In this EvoLLLution article, Indiana University’s John Wilkerson sheds some light on the importance of international recruitment and reflects on a few of the key challenges to recruiting and retaining this population. Capitalizing on Niche Markets in Higher Education: A Look at International Education: In this EvoLLLution article, David Stremba provides an overview of the American international higher education landscape. He points out a few of the imbalances and discusses the importance of global learners for colleges and universities today. Some Things Don’t Change: The Global Draw of American Higher Education: This EvoLLLution article by Fort Hays State University’s Cindy Elliott breaks down some of the key reasons why students all over the world are looking to the United States as a destination for their postsecondary education. It’s critical that demand be matched by access on the institutional side. International Students in the United States: This report from the Institute of International Education is based on a survey of international students who were enrolled at colleges and universities in the United States. It goes into detail about their preferences, motivations and criteria for choosing a higher education destination. Desire isn’t enough to succeed in the international marketplace. For institutions committed to growing their global presence, the first step is to grow non-credit English language offerings aimed at international students.